Kitchener Downtown CHC, with funding from the WWLHIN and in collaboration with St John’s Kitchen, Sanguen Health Centre and The Centre for Family Medicine has launched a full time primary care outreach team. The team includes a Nurse Practitioner, a Medical Doctor, a Nurse and a Community Health Worker who will provide Primary Care to people who may experience barriers to accessing health care, especially those who have experienced or who may be at risk for homelessness. One of the team will assess your physical or mental health concerns and offer treatment or a referral. Our team will support you without judgement. We embrace Harm Reduction principles. We do not require a Health Card number, but can help you get one if you do not have one. 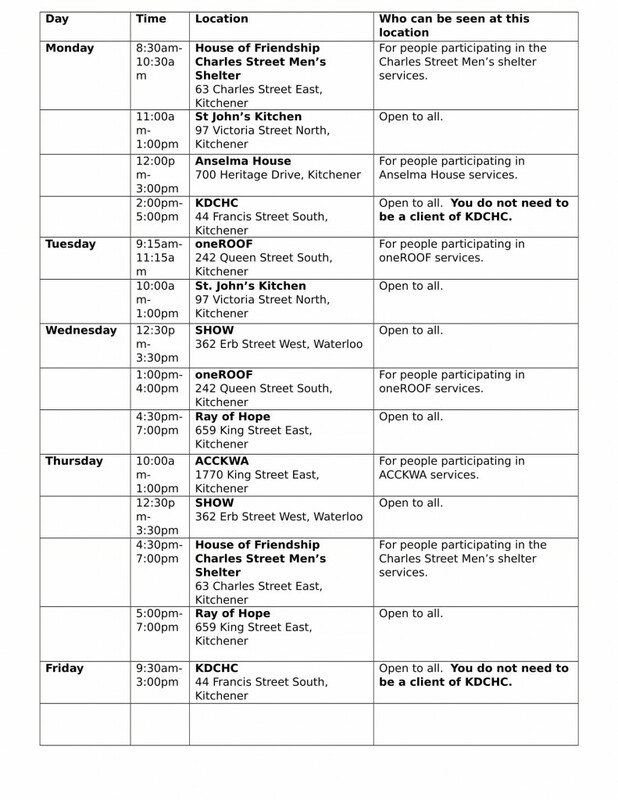 The goal for the Kitchener Downtown CHC Outreach Team is to offer Primary Care in places where people gather or live. See below for a list of our current clinics and times. This schedule is always subject to change. Please always call 519-745-4404 ext. 256 to hear any updates on today’s schedule.